President's Blog - Where Is The Trust? The concept of utilizing a trust to protect and distribute assets is time-tested and fairly well understood. But perhaps the name needs to be changed. There seems to be less “trusting" going on in the trust industry. Although the pure number of wealthy Americans continues to grow, the sheer number of managed personal trust accounts continues to drop. Simply put, wealthy investors are not putting their trust in trusts the way they did years ago. According to Spectrem’s 2018 Comprehensive Bank Trust Update, the number of personal bank trust accounts held in trust institutions dropped in 2017 to 556,142, marking the eighth consecutive year the total number of trusts has declined in America. The total personal trust assets increased in 2017 to $964.3 billion, the first increase in three years. The number of managed trust accounts, those accounts which are overseen by a trust professional, dropped to 504,792, marking the third consecutive annual drop in managed accounts. The number of non-managed personal trust accounts also fell, to 51,350, marking the fifth decrease in a row. 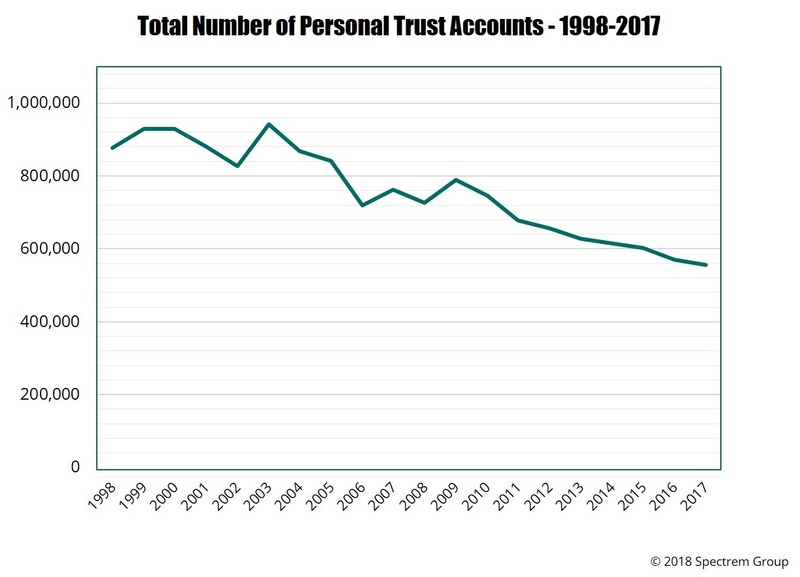 For comparison’s sake, the total number of personal trust accounts in 2003 was 940,961, almost 400,000 more than there were in 2017. The number of managed accounts has fallen from 859,000 in 1998 to the 504,000 in 2017, a similar decrease. Investors are doing something else with their fortunes, and the Bank Personal Trust Industry needs to pay heed. These numbers are problematic, and representative of the way investors think about managed trust accounts. The Spectrem study, completed annually since 1998, goes beyond the numbers to indicate how investors perceive bank trust officers and why they so often “trust" someone outside of the industry to manage their assets. But promoting banking trust services in a time of overall asset growth should be easy. More importantly, it should be a major priority at a time when the number of potential clients continues to grow as assets increase and populous Baby Boomer and Gen X generations consider how they are going to transfer their assets. Establishing a long-term relationship with a client was easier back when banks were the choice of most Americans. There was a familial bond that existed between the investor and the banker and that bond extended to the long-term decisions related to asset management and wealth transfer. But now that so much wealth is being distributed, there is an opportunity to create a bond that extends beyond the individual investor to their family. By properly explaining the advantages of working with a knowledgeable and trained professional on trust management, banks can create an account that could last through generations of the same family. Very often an investor decides to allow Brother Bob or Uncle Charlie to manage their trust. Do they understand the tax ramifications of every decision he makes? What if something unforeseen impacts their ability to handle the account? And even if they can handle the task of managing a trust, does the next generation in your family have an Uncle Charlie to turn to? The bank trust department is going to be there long-term, and may have more reliability then Brother Bob or Uncle Charlie over time. Recent Spectrem research indicates that younger investors have a more positive view of banks than older investors, perhaps because their perception has not yet been affected by unfortunate outcomes in the past. By promoting trust management options with young bank clients, trust providers can create a new market of grantors and establish a relationship that can bloom as the young investor’s assets grow. 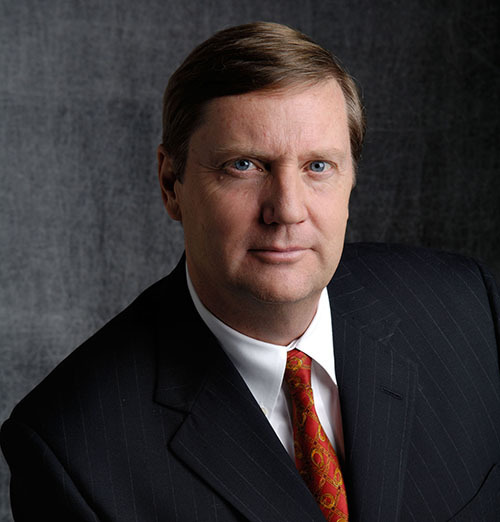 The Trust Banking Industry is a well-established time-honored part of American personal financial management. Its decline need not be a time-honored part of American personal financial management. Click below to download our new whitepaper, Eight Ways to Save the Bank Trust Market.